“It’s hard to believe that we got here – it’s been a long, long struggle. But we have come to the end of the tunnel. Dylan’s ok, the family is ok. It means the world to me we have come through it. At the moment he is just getting over his side effects. He is still having a lot of problems with his mobility, skin and psychologically as well. It’s a big deal when children are diagnosed, staying in hospital. They are away from family and then, all of a sudden, it’s all over. They have to deal with getting back to school, meeting up with friends again and being able to join in. I think that’s a big thing for him at the moment. 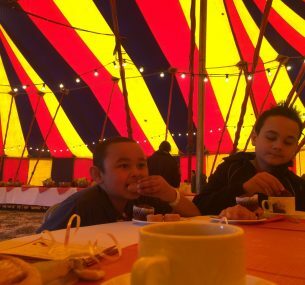 We recently had a lovely day out as a family at Zippos Circus, that was brilliant. It was an event where we could just be ourselves, chill out and we had fun together. We met other families that were or still are in the same position as us. 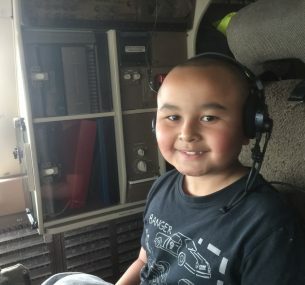 Children with Cancer UK have helped us a lot with the days out, the communication and all the funding that goes into helping children with cancer. A lot of cancer charities don’t actually fund research in to childhood cancer and we know that Children with Cancer UK does. That’s a big thing for us parents. My message to other parents and children currently receiving treatment is that there is light at the end of the tunnel. Everyone’s diagnosis is different and how they react to treatment, but our children are strong. Just love them, be there for them and hopefully you will get through. “Dylan wasn’t himself – I knew something was wrong. Rather than join his brothers playing, he preferred to snuggle on the sofa with me. When we noticed that Dylan had a swollen wrist, my husband and I decided to take him to hospital to get it checked. I explained my worries to the doctor we saw, explaining that his symptoms were reflective of an article I had read where the child was diagnosed with cancer. “I knew it was bad as soon as the doctor asked to speak to us in private. Although cancer had crossed my mind I never believed Dylan had it. We were totally shocked and heartbroken for him. I remember just bursting into tears with my first thought being that he’s going to die. It was very hard since we had six boys ranging from 1-17. We were told that Dylan would have to be kept in hospital for further tests and treatment. I’m disabled and my husband is my carer. We asked my cousin to pick me up, and my mother-in-law to stay over to help me. We had to explain to Dylan he was poorly with bad blood and needed to stay in hospital. He was so upset that I couldn’t stay with him, but accepted that daddy would be with him. The next couple of weeks went by in a sort of daze. We learnt Dylan had Acute Lymphoblastic Leukaemia (ALL) and were told what type of treatment he would need. I also had to explain to him that he had cancer – I didn’t want him find out from someone else. I was taken aback when he replied “am I gonna die?” Of course he’d heard about cancer, and many times it’s associated with death. “Dylan was put on regimen A for treatment which was intense to start with. The intravenous therapy (IV) was taking its toll. Every time they poked him he would scream in pain. So he had a port put in to make administering the drugs easier. It was tough seeing him getting prepared for his operation. He was given lumbar punctures to test the fluid and to put the chemo in directly. All other chemo was given through his port and up until now that’s how he is accessed for weekly bloods and chemo, although he does take oral chemo. Dylan was also on steroids, which saw him balloon up and his mood swings became intense and frequent. That was hard, and is still hard to deal with because it’s not the Dylan we know. In remission, but for how long? “If anything positive has come out of Dylan’s diagnosis it is all the help and support we’ve had from family, friends and complete strangers. Lorraine has since sent us the photo of Dylan and the dolphin, taken in July 2016, on a family trip to Florida organised by the Rays of Sunshine Children’s Charity. 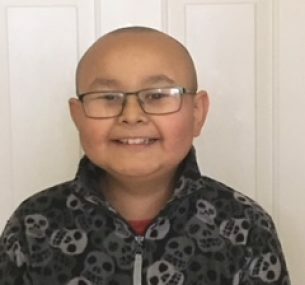 “Dylan is doing okay at the moment, he had a very long absence from school due to being neutropenic and chicken pox spreading around school like wildfire. After long absences he gets nervous about returning and is clingy to me and gets anxious but he copes really well and his school is amazing with helping him settle in and making sure he’s up to date on what they’ve been up to so he can fit back in easier. He’s had some problems with leg pains due to side effects of chemotherapy. They referred him to a physiotherapist, who in turn also referred him to a podiatrist for specialist insoles. Dylan has been given exercises to do at home to strengthen his muscles and will be starting hydrotherapy next week, we are hoping these treatments work and he is pain free and walking ‘right’ again soon. Most of the time, Dylan is very upbeat and gets on with whatever is thrown his way but still gets down sometimes with side effects, especially the hair loss, I think he feels he stands out too much. Sadly for him his class is going away camping for a couple of days and he can’t go so is a bit upset about that; he hates to feel he’s missing out and is worried about his friends making memories together that he can’t be part of. Dylan’s treatment is going well and we are all overjoyed that everything is running smoothly (apart from certain side effects) so we are really grateful for that. I often wonder why us? Why Dylan? And still can’t find answers to that but I suppose the thing I am most grateful for is the love and support we receive daily, it’s amazing. “Dylan is currently on painkillers three times a day as he has painful aching legs, his feet have turned outwards which is caused by lax muscles and ligaments, and this is another side effect of chemotherapy. 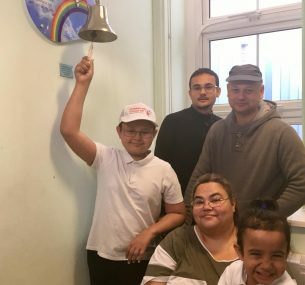 Dylan has physiotherapy and has been given strengthening exercise and will start using their gym (under the physiotherapist) to help. 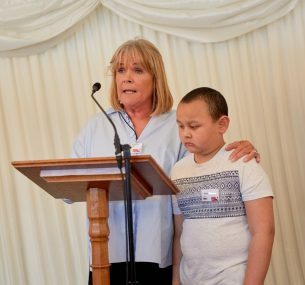 Getting Dylan to do the exercises can get difficult as he’s often tired already when he comes home from school but he now has to come home in the car as he can’t manage the walk home without being in pain, this was another thing that we took for granted before Dylan’s diagnosis. Dylan also sees a pain specialist; this is to help him get the right medication in the right dose to help him. Dylan’s end of chemotherapy treatment should be in March, which is something we are all looking forward to, although he will have to continue with all the other pain medication and physio to combat all the side effects that the chemotherapy has destroyed within his body. Last month was the three year anniversary of Dylan’s diagnosis. It’s changed our family and son completely; it feels like we’ve had a tornado storm through and it’s tried to wreak havoc on us. “We all had a lovely weekend away in November 2017 to Disneyland Paris where we had a great family time together; it was also the first time the children stayed in a proper hotel which they loved. 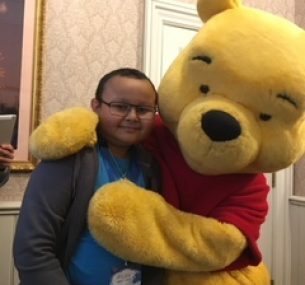 They even got a special meeting with Winnie the Pooh and were made to feel extra special but on our return the winter weather kicked in and we all had to have the flu jab, we had to have it because of Dylan’s low immunity. Dylan got a high temperature just before Christmas so was admitted into our local hospital and put on intravenous antibiotics; it was a very awkward stay as he had to move beds three times over 48 hours due to this hospital and all the others within South London being full for cancer patients. When a child like Dylan with cancer is admitted into hospital they have to be isolated as they are prone to infections, which in Dylan’s case he already had, so it’s important for them not to catch anything else as it’s harder to fight without neutrophils. A person without sufficient neutrophils is neutropenic which means no immunity to fight infections. Dylan was also put on a course of oral antibiotics and was so happy to be sent home. Wwe all had a lovely Christmas but it brought it home to us how easily Dylan could have spent Christmas in isolation over Christmas like many children do. Dylan is now on cycle 11 and thankfully has only one more cycle of treatment to go through. He’s off school again due to being neutropenic with a cough and cold, sadly his hair fell out again last week so he was upset about that.